I had high hopes for this book after reading the first two in the series. Although the book was good, it wasn’t amazing like the first two. I loved the prologue! That was probably the best part of the book. I know it was probably mostly speculation on the part of the author, but I would love to believe that it is true. That being said, the way Nehemiah was introduced was unique and I liked his character most of the time. My favorite character would be a tie between Nava and Shimon, though. The dialogue was realistic to me as with the other books. In some ways, I felt like the author wrote this because she wanted to round out the series into a trilogy. It didn’t seem quite as complex of a story or as interesting as the other two. There were also less connecting characters which disappointed me. I wanted to see Reuben and his wife and only got Rebbe Ezra! There were times when the book dragged a bit too much for me. There weren’t as many main characters as in book two which would have helped some of the subplots move along a bit faster except that the author choose not to do so. I think that was a mistake. I actually found it easy to put this book down until the very end. There was more draggy detail and not quite enough action or something. I honestly can’t quite pinpoint the exact reason this book was harder to read than the rest. In some ways there was more action because of the fighting. Actually, that’s probably what the problem is. There was fighting mentioned, but never fully described. I would have liked to see more and be told less. I enjoyed finding out the end of the story of how Jerusalem and the temple were rebuilt. Despite it’s faults, this book was good and I really liked the plot line of Nava, Chava, and Malkijah. Thanks for reviewing, Faith. It’s super helpful. 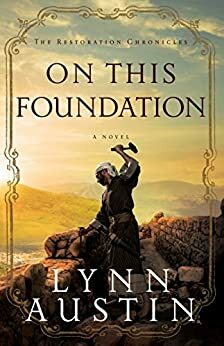 🙂 I’m not into Biblical Fiction, but I think this author’s written other books too (like American Civil War era) and I’ve heard that they’re pretty good!